The previous page concluded the schematic for the rocket igniter circuit. The schematics are translated onto a circuit board layout to produce the board. In anticipation of some readers wanting to etch the board at home, I tried to put as much as possible on the bottom side of the board for single-sided etching. The top side of the board can be etched if you’re comfortable with double-sided alignment. Alternatively, the top side can be connected with six wires as shown below. Given the wide traces and through-hole components, this circuit was a perfect opportunity to try some new etching techniques. 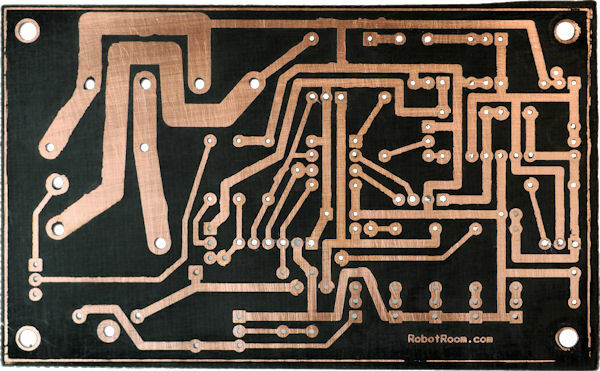 Often, you’ll need to cut a copper clad board down to size, or you’ll want to separate smaller PCBs from a panel. I’ve tried a Dremel cut-off wheel, a table saw with a diamond blade, a milling machine, and an underpowered shear. 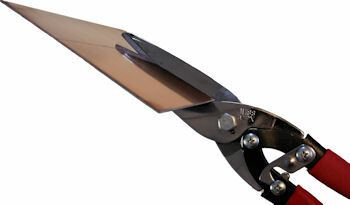 Some readers have suggested heavy-duty scissors for thin boards. I stepped up and purchased a Wiss MPX compound action cutter (037103190635) for $22. This hand tool easily cuts through 1.6mm (0.063 inch) double-sided copper-clad board, which is what you’ll usually get from PCB manufacturers. With effort, this tool even cuts through 0.1 inch thick boards, which is unusually thick for hobbyists. A significant advantage of using the Wiss MPX snips rather than a cutting disc or saw is that there is no dust. However, the serrated blade does slightly warp the copper and substrate near the edge, leaving a wavy pattern. 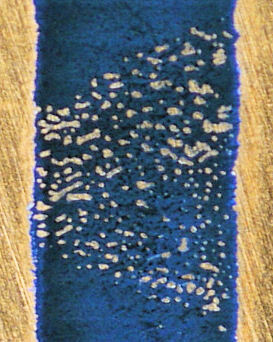 A reoccurring problem in etching your own circuit boards is that the toner often does not transfer completely near the edges of the board. Perhaps the edges are slightly higher from burrs and bends caused during cutting. When the iron or laminator passes near the edge, these raised areas prevent even pressure on the nearby transfer film. 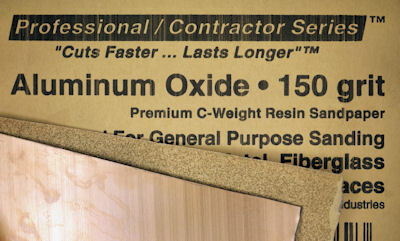 After cutting the boards, but before applying the transfer film, the tips of the edges of the board should be sanded with 150 grit sand paper. This is a fairly rough grit, but the goal is to remove raised areas rather provide a polished surface. After sanding, but before etching, the board needs to be thoroughly cleaned. On the opposite end of the spectrum from unadhered toner, some toner seems spread out, as though it had been squished by too much pressure. As an experiment, I decided to apply light pressure, but more heat. Unfortunately, I was overzealous and cranked the iron up to the maximum setting ('linen'). Instead of the recommended 150 °C / 300 °F, it appears I approached 230 °C / 450 °F. The instant I put the iron on the transfer film, I heard it crackle. A complete disaster would have been if the film had melted onto the iron itself. Although the film adhered much more strongly to the board than usual, it eventually peeled off. My mistake resulted in spots of the image becoming melted and cracked. I repaired delicate or large breaks with a Sharpie silver-colored fine-point permanent marker (39108PP). In the past, I’ve found the ink from black permanent markers tends to dissolve during etching, but the silver marker worked perfectly. Ⓐ Melted area didn’t etch with pinholes. Perhaps the surface tension of the etchant prevented it from reaching the copper in the tiny valleys of the melted sections. Ⓑ Ⓒ The areas where silver-colored ink was accidently overdrawn show no loss of copper. These results suggest this type of pen is a superior choice to the black permanent markers I’ve used in the past. Ⓓ The final etched shape and size of this hole is different than would be expected based on the image of the transferred toner. Perhaps the board needed a little longer to etch. The last new technique I tried was applying etchant using a sponge rather than immersing the board. Always wear gloves and perform the etching in a plastic or glass tray. 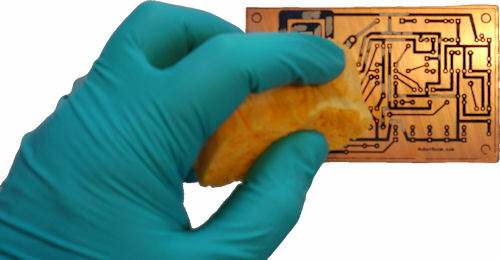 Simply soak a portion of a sponge in a small amount of the liquid etchant and 'paint' it onto the board. Don’t scrub the board with the sponge, but instead wipe the board to both apply fresh etchant and gently mechanically remove etched copper. Between strokes, the etchant and board are exposed to plenty of ambient oxygen, so an air bubbler is not needed. Although I didn’t time it, the board seemed to take about as long to etch with a sponge as it takes with a full immersion technique. Unlike immersion, the interior copper seemed to erode first, with the outer edges taking the longest. I suspect this was due to my approach, where etchant tended to pool in the middle but drip away from the edges. 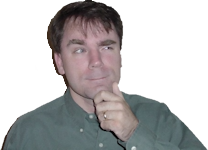 However, because I was actively involved with the process, I switched to applying etchant only to the edges when it became apparent that the interior was complete. Because of the control over the process and the reduced amount of etchant used, I will definitely try sponge etching again. I will try adding a heating pad or plate warmer under the tray to see if that speeds the process. 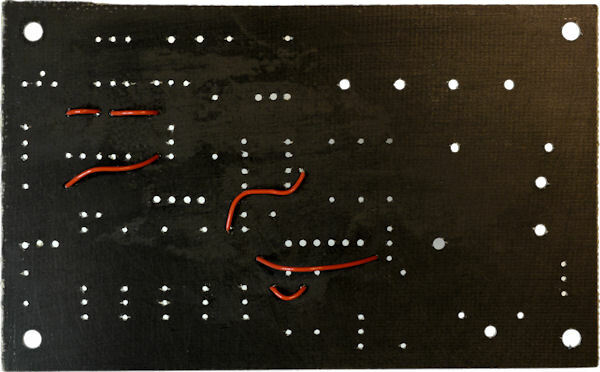 Let’s take a closer look at the etched board using a photographic tool.